This work was done for a summer research project co-sponsored by Harvard GSD and Peking University, and with work exhibited at an exhibition at Peking University. 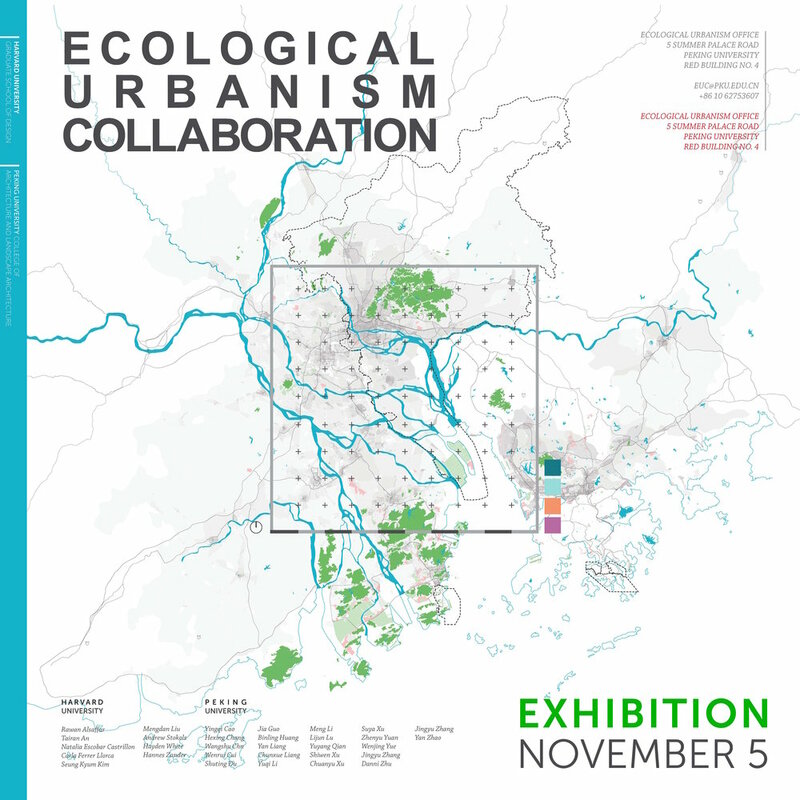 We worked with the city of Xi'an's Urban Planning Institute to study the regional ecology of the metropolitan area and provide planning strategies for developing tourism in historic villages on the periphery of the city. As cities in China expand rapidly and devour farmland in their wake, governments are looking for ways to manage this development in a way to maintain arable land and preserve historic sites and the natural environment. We undertook a multi-scalar analysis, beginning with the region, the city and finally working our way to the scale of the village. Landsat color spectrum analysis was used to classify ground cover in Xi'an among other regions in China, showing the extent of urbanization over the past few years. This image is from 2017 data. The first part of our work with the Xi'an institute of Planning involved an analysis of the regional ecosystem, and an understanding of the importance of the Wangchuan area as a key river and watershed irrigating the Guanzhong Plain, or the central area around Xi'an. Wang Wei was a poet in the Han Dynasty whose writing memorialized a garden located in the current area of Wangchuan Township. Unlike later formal Chinese literati gardens, “Wangchuan Villa” was actually a large productive landscape incorporating villages, farms, mountains, and streams. The garden was a model of the harmony between nature and man. 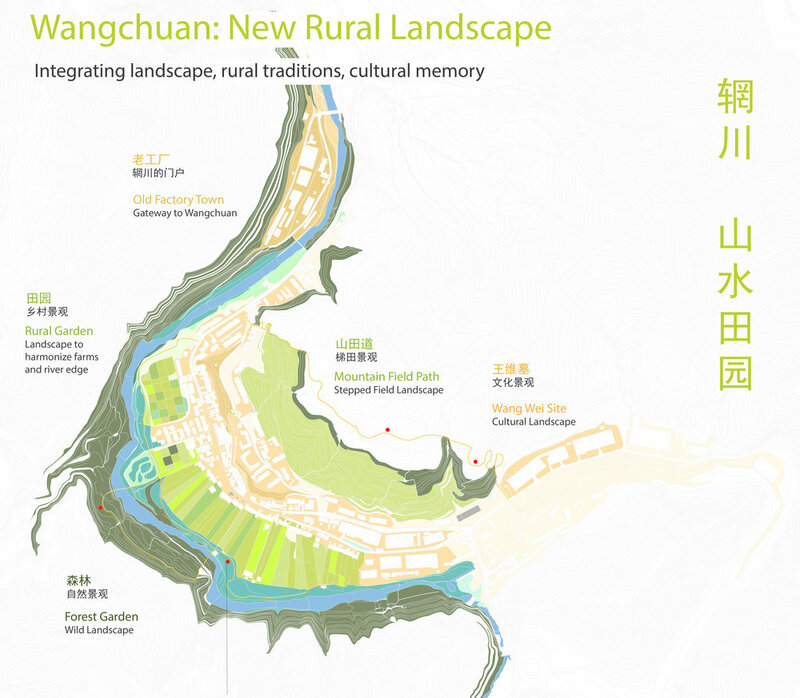 Inspired by Wangchuan, as well as the traditions of formal Chinese gardens that typically feature a path connecting “scenic views” for viewer contemplation, the plan for the village creates a series of paths to connect scenic points around the village, surrounding fields, river, and mountains.